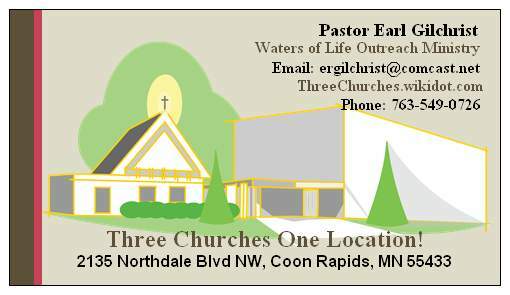 On June 27 th, 2003 after much prayer, counseling and confirmation, Pastors Earl and Pamela Gilchrist were commission by God, and their parent ministry to found, “Waters Of Life Outreach Ministry. They only accept the founding of, because they know it takes GOD to establish it. The ministry Vision is based upon Matthew 25:35-45; “I was an hungered, and ye gave me meat; I was Thirsty and ye gave me Drink: I was a Stranger, and ye took me in. Naked, and ye clothed me: I was Sick, and ye visited me: I was in Prison, and ye came unto me". Vs.40; “…verily I say unto you, In as much as ye have done it unto one of the LEAST of these my BREATHREN, ye have done it unto me". Our Vision: is to see God’s people walking in the Excellence He’s called us to, Excellence of Character, Excellence of Life, Excellence of Ministry. We’re challenging God’s people to allow God to tap into the Greatness He’s place inside them. To equip people with a hunger and thirst for righteousness, a PASSION for the things of God! Our ministry is geared to touch not only the “Down And Outers,” but also the “Up And Outers”. We understand that “Out Is Out,” and The Healing Is In The HOUSE for ALL Hurting People ! Everything the Body needs, is in the Body. 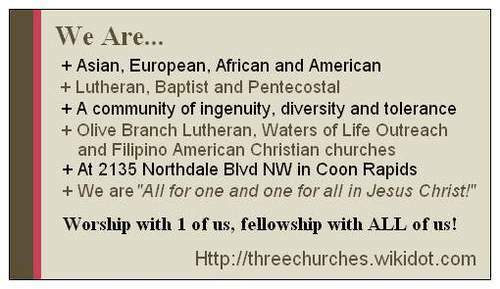 “Waters Of Life Outreach Ministry,” is called and Anointed by God to Build Strong Men, Strong Women, Strong Families, and the “Healing Of The Races.” To see Men, Women, Boys, and Girls, Saved, Delivered, Healed, and Set-Free, by the Power Of The Lord Jesus Christ!!! We’re willing to God Down to “Some-Area” and Preach Christ, where others dare not go. Waters Of Life Outreach Ministry, was founded by Pastors Earl and Pamela Gilchrist, but established by the Lord Jesus Christ, June 27 th 2003. We were Commission to go out with the Blessing of our parent Church. It is a ministry that God’s sown into the earth in this millennium, for such a time as this. The ministry has been developing since the day Earl gave his life to the Lord, May 14 th, 1986. That was in Stillwater State Prison, D-Hall, after an extensive life of crime and drug abuse. I went to Boys School as a teen. I’d been in several City and County Jails, in Workhouses, and I’ve been incarcerated in prison 5 times, for various crimes, Robbery, Possession With Intent To Distribute, Grand Larceny, Forgery, and lastly 2 Aggravated Robberies in which his co-defendant was killed by the St. Paul, police. My drug usage extended over a period of 24 years. I used Robitussin AC, Valium, Marijuana, Dexes, Morphine, Dolophine, Dilaudid, Darvon, Dorvocett, Percodan, and my preferred drugs were; Heroin, Methodone, Cocaine, Crack and Methamphetamine (called Crank at the time). During the course of my 5 th prison incarceration God got hold of me. I became a Christian. Started taking College, Bible Correspondence Courses. I received my A.A. Degree and enough credits to receive my B.A. Degree. New programs were established in the prison to accommodate my walk with God. When I got to Minimum Security, I was privileged to leave prison on Sundays to attend Church services. I met my Present wife Pamela (Snoddy) Gilchrist, in 1992, while incarcerated. She visited me for approximately a year. Upon my release we continued to see one another. And on June 11 th 1994, we were married. Pamela, became a member of the “River Of Life Church, where she also became a Deaconess and was involved in several ministries. * A member of the Prison Team Ministry, to Shakopee Women’s Prison, and the Women’s Workhouse. * She was also a member of the 12 Step Free-Indeed Ministry Leadership Team. Pamela experienced the life of partying, drinking and smoking marijuana. There were also other abuses i.e. abortion, etc. Now she stands arm in arm with the man God’s given to her preaching and teaching the Gospel as she’s been ordained to do. She was also ordained a Pastor June 22 nd, 2003. I continued my education. Received his B.A. from the Minnesota Graduate School Of Theology, May, 23 rd, 1992. Was Paroled January 24 th, 1993, received my Masters Of Arts Degree, in Pastoral Care and Ministry, June 9 th, 1996, and went on to receive my Doctoral Degree, in Ministry and Clinical Counseling, October, 11 th 2002, with a 4.0 GPA. Upon my release I continued to attend the “River Of Life Church,” in St. Paul. After 2 years I became a Deacon, and 4 years I became an Elder. My Pastor became sick, and prior to his death December 24 th 1998, he shared with the other Pastors that he wanted me ordained a Pastor. On December 27 th, 1998, I was ordained a Pastor. All along I was a very intricate part of the ministry. * I was the leader of Men’s Fellowship. * I was permitted after only 18 months to go back into the same prison I’d been paroled from. Something that’s never been done before. We have the largest Bible Study in the system each week. * I started working for Minnesota Teen Challenge, February 14 th, 1995, where I’m presently employed. God’s been establishing this ministry from the Day One, nothing has been in vain! There have been TOTAL FAMILIES healed and restored. Changed lives by the miraculous power of God!!! We’re committed to teaching how we can develop a Systematic Method of making a Practical Application of God’s Word to our Lives on a Daily Basis. Learning to Live According To (In Harmony With) God’s PRINCPLES! We don’t have to Believe the “Truth,” but it’s the “Truth” whether we believe it or not. I’ve learned the “Truth” won’t adjust itself to what we “Believe”. What we “Believe” has to adjust itself to the “Truth”. The principles of God work for the Just and the Unjust. The Bible says it Rains on the Just and the Unjust. Likewise the Sun shines on the Just and the Unjust. Lk.6:38; says, “Give and it SHALL be given unto you…” That’s a PRINCIPLE. But you have to Give in “FAITH” believing, or with “Expectations” of a “Harvest”. IF YOU EXPECT NOTHING, YOU GET NOTHING!!! The prerequisite for a Bountiful Harvest, is the condition of the SOIL. Are you Sowing into GOOD GROUND? Waters Of Life Outreach Ministry is proven to be GOOD GROUND! You’re Invited To Come Out And Worship With Us. Pastor Earl R. Gilchrist, is a living testimony of the miraculous, transforming, delivering power of the Lord Jesus Christ! Earl, has been in prison 5 times in 3 different states. He spent over 181/2 years of his life there, (not including city/county jails and workhouses). He’s been charged with crimes ranging from petty theft to 1 st degree murder. He was known around the country as a very vicious, violent, and dangerous man. He was addicted to heroin, cocaine, crack, methadone, dillaudid, and cough syrup. During his years of use $500.00 dollars a day was the minimum he spent. In January of 1986, Apostle Arnold P. Williams, visited him in the Ramsey County jail, where he was facing 3 aggravated robbery charges, 2 in Henn. Co., 1 in Ramsey, and a possible 1 st degree murder. Pastor Arnold, spoke life to him, in what appeared to be a hopeless situation. And the anointing that was on him removed the burdens and destroyed the yoke long enough for Earl, to make a decision for the Lord. Although Earl, received 136 months for the crimes he committed, May 14 th, 1986 he accepted Jesus Christ, as his personal Savior and Lord. He’s been “radically” saved every since. While incarcerated Earl, received his AA degree in theology and the bible and enough credits to receive his BA degree, maintaining a 3.92 GPA. Since his release, he has maintained an active membership in the River Of Life Church. He became a Deacon, an Elder, and now one of the Associate Pastors. He received his M.A. in Pastoral Care and Ministry, in 1996, and his Doctoral Degree, in Ministry and Clinical Pastoral Counseling in 2002, 4.0 GPA. He was a part of the 12 Step Free-Indeed Ministry for 11 years. He headed up the 12 Step Ministry for 0ver 5 years. He has also been part of the Prison Ministry Leadership, for 8 years. Every week he goes back into the same prison he was released from and holds bible study, along with others. While incarcerated Pastor Earl was compelled by God to write an autobiography and testimonial book, which he had published when he got out. The name of his book is “HOW I GOT OVER”, and gives details of his life as a gangster. It’s educational, informational, and a testimonial. The title was taken from the scripture in 1Jn.5:4; “For whatsoever is Born Of God Overcometh the world: and this is the Victory that overcometh the world, even our faith. He is also the 1 st phase lecture instructor and senior counselor at Minnesota Teen Challenge. He was married to his gift from God, Pamela J. Gilchrist, June 11 th, 1994 and they have been happily married for 9 ½ years.